In early 2009 many of Iceland’s residents took to the Reykjavik streets to protest their government’s response to the country’s deep financial crisis and this real-world event forms the backdrop for the start of this fictional, though highly credible, story. At one protest several strangers meet. They include Harpa, a young single mother who worked at one of the banks which played such a major role in ruining the country’s economy, Bjorn, a fisherman who lost his boat and most of his money due to the crisis and Sindri Palsson, an ageing writer and political radical. The group has a few drinks together following the end of the protest and then become involved in a very unsavoury event. Later in the year the former head of the same bank that Harpa had worked for is killed in London. English police wonder if there is an Icelandic connection to the murder and Magnus Jonson, an Icelandic born American trained cop who is working with Icelandic police, willingly gets involved with the investigation. More than one reviewer has remarked on Ridpath’s bravery (or is it chutzpah?) in taking on the Scandinavian crime writers at their own game but, from what I can tell, he’s a match for the locals. At any rate this story is very topical and seems to have captured some of the things that are unique to Iceland’s experience of the global financial collapse (known there as the kreppa). Ridpath uses his character’s differing experiences of the crisis, as minor players, victims or police trying to keep control without using the harsh violence similar protests in other countries have attracted, to show readers just how deeply this tiny country was affected by the world’s recent banking-led madness. Knowing little about the book before embarking on it I hadn’t expected this aspect but found it utterly compelling (and a lesson to lesser authors in the show-don’t-tell methodology of writing). The main story too was, somewhat surprisingly, very engaging. It’s not every author who can keep readers’ attention after revealing significant portions of the ‘whodunnit’ element of the story early on but Ridpath manages it by leaving enough details hidden and throwing in a red herring or three. He also incorporates a whole other story about Magnus’ family history which includes the murder of his father a few years earlier and other dark events from the family’s past. This helps to flesh out the character of Magnus and provide some explanation for some of his character traits, although this element of the novel does get a bit woolly at times due to the many disparate threads that take a while to link up. Overall though this is a well-paced mix of procedural and thriller and its exotic (to me) setting is interestingly displayed. 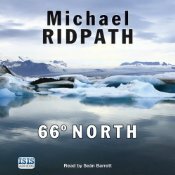 Ridpath makes use of uniquely Icelandic things such as the country’s love of its literary sagas and the affect that being a small population has on society without resorting to over used stereotypes and the like. Seán Barrett, as always, does a fine job narrating the audio book (and helping me with my Icelandic pronunciation). A thoroughly recommended read. 66° NORTH has been reviewed at Euro Crime. This entry was posted in book review, Iceland, Michael Ridpath. Bookmark the permalink. Bernadette – I like your use of the word chutzphah in describing Ridpath’s decision to set his Magnus Johnson stories in Iceland. I agree he does a terrific job of it too. I’ll confess that I’ve not gotten to this one yet but I thought its predecessor Where the Shadows Lie really did evoke Iceland very well. I’m glad you think this one was a good ‘un too. I liked this one, too. The author has a brisk style with few sections that lag. I think he’s spinning out some of the central issue (Magnus’s family), having read the third one it is getting a tad repetitive, but I’m sure he’ll tie it all up excitingly in the fourth novel (I think this was originally intended as a quartet though these goalposts often shift).